Join now and receive these 10 classic radio shows emailed to you via digital download. 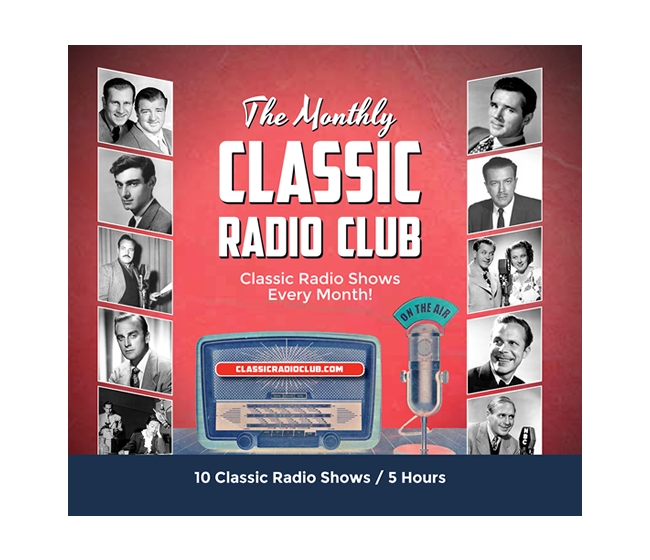 Afterwards, you'll receive 10 different classic radio shows emailed to you each month! Join now and receive 10 Classic Radio Shows emailed to you via digital download. Afterwards, you will be sent 10 different Classic Radio Shows emailed to you each month and automatically be charged every 6 months. You can cancel your renewal at any time. Join now and receive 10 Classic Radio Shows emailed to you via digital download. Afterwards, you will be sent 10 different Classic Radio Shows emailed to you each month and automatically be charged every 12 months. You can cancel your renewal at any time.